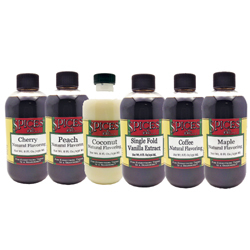 All Natural Flavorings | Spices Etc. Banana Flavoring has a wonderful banana flavor to add a taste of the tropics to chocolate sauces and french toast batter. Banana Natural Flavoring is great in milkshakes, pudding or ice cream. Try a few drops of this flavoring in a container of vanilla yogurt or in warm syrup before you pour on your pancake! Natural Banana Flavor. Non-flavor ingredients include alcohol (14.8%), sugar, water, citric acid. Black Walnut flavoring is a rich product that makes supermarket walnut flavoring look watery. With an authentic Black Walnut flavor, this natural flavoring is a must for your special cookies and cake frostings. Spices Etc. 's 100% Natural Black Walnut Flavoring is the best selling flavoring on the market and guaranteed to create a traditional, real Black Walnut taste for all your baking and cooking needs! Black Walnut made with natural ingredients. Non-flavor ingredients included water, sugar, propylene glycol, salt. Blueberry Flavoring might as well be picked in a field because of its wonderful blueberry taste. Blueberry Flavoring enhances and gives fresh blueberry flavor to supermarket or canned berries or try mixing a few drops with butter for your muffins or your homemade pancake batter. Natural blueberry flavor. Non-flavor ingredients include water, sugar, alcohol (14.8%), citric acid. Brown Sugar Flavoring is perfect to use in place of Brown Sugar in recipes, or to give your favorite baking dish a little more flavor. Use Brown Sugar Flavoring as a sugar for baking, but be careful because it is very strong. Add 1-2 teaspoons to your secret, family barbeque sauce for a sweet treat on ribs and chicken! Made with natural flavors. Non-flavor ingredients included water, sugar, salt, alcohol (15%). Butter Natural Flavoring is a natural sweet cream butter flavoring tha can add a rich butter flavor to your recipes without adding the cost of a stick of butter. Perfect for frostings and also to add flavor to breads and rolls. For a quick meal side, add 1 teaspoon of Butter Flavoring to water before you add instant rice for cooking, it is delicious. Made with natural ingredients. Non-flavor ingredients include water, alcohol (24.9%), propylene glycol, xanthan gum. Butter Pecan Flavoring has a distinct flavor of the South by combining the wonderful flavor of butter with the delicious taaste of pecans. 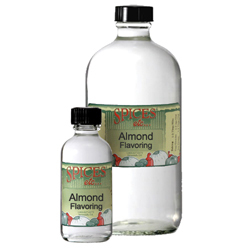 Butter Pecan Flavoring is perfect to add when baking a cake or to add to homemade vanilla ice cream! 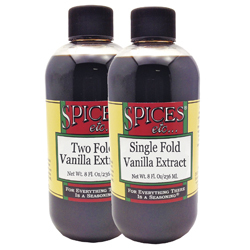 This flavoring is a must have for baker's, the possibilities of uses are endless! Made with natural ingredients. Non-flavor ingredients include water, sugar, propylene glycol, salt. Caramel Natural Flavoring has a rich, sweet flavor that is perfect for cake frostings, pancake batters and adding a hint of caramel to your morning coffee. Add 1 teaspoon of Caramel Natural Flavoring to chocolate icing the next time you make a pound cake, the flavor is unreal! Caramel flavoring is made with natural ingredients. The non-flavor ingredients include water, sugar, salt, propylene glycol, sodium benzoate. Cherry Natural Flavoring is a high quality, strong flavoring perfect for baking and candy making. Cherry Flavoring adds fresh cherry flavor to a variety of dishes, and is particularly nice for flavoring iced tea or seltzer. Use Cherry Flavoring when you need to boost the flavor of canned cherries or preserves! Made with natural flavors. Non-Flavor ingredients include: water, alcohol (16.5%), citric acid. Chocolate Natural Flavoring has a concentrated, unsweetened chocolate flavor and is perfect to add to confectionary goods, icings, smoothies and really, any baked goods!. Great to boost flavors in ice cream and milkshakes with a high quality, real Chocolate flavor! Contains natural flavors and added color. Non-flavor ingredients include propylene glycol, alcohol (17.4%), water, caramel color, sugar, malic acid. Cinnamon Natural Flavoring has a strong cinnamon flavor and aroma that taste exactly like fresh, ground cinnamon. Cinnamon Natural Flavoring is perfect to use in ice creams, syrups, baked goods, mulled ciders and tea and coffee. Cinnamon Natural Flavoring is one of the most versatile flavoring on the market and can add a kick to cookie icings. Made with natural flavors. Non-flavor ingredients include propylene glycol. Coffee Natural Flavoring takes the delicious flavor of fresh brewed coffee and allows bakers to utilize the great flavor to cook with in cookies and icings. Coffee Natural Flavoring is exactly right for coffee ice cream and chocolate mocha syrup. A drop adds richness to beef gravy and can add a unique flavor to barbeque sauces. Made with natural flavor. Non-flavor ingredients include water, propylene glycol. French Vanilla Natural Flavoring has the wonderful, creamy flavor of vanilla custard. It has a wonderful flavor that combines butterscotch, caramel and hazelnut flavors and can be used as a substitute for vanilla extract. French Vanilla has a sweet, slightly more buttery taste than regualr vanilla. Great in coffee or baking! Made with natural ingredients. Non-flavor ingredients include water, alcohol (37.7%), corn syrup, annatto extract. Hazelnut Flavoring is one of the most popular flavors used in bakeries across the country because of the hazelnuts sweet and buttery flavor. Hazelnut flavoring is also popular because it works very well with Vanilla extract and other common baking flavors, such as coffee and chocolate. It is great in cake mixes, cookies, ice cream and muffins! Non-flavor ingredients include propylene glycol, alcohol (43.9%), water. Key Lime Flavoring can be used in lime pound cake, lime cheesecake and, the most popular, key lime pie! Are you looking for a early morning pick me up? Try adding a little to your morning orange juice. Goodness gracious, this flavoring brings out the true key lime flavor in icing, cookies and pies. Key Lime Flavoring By popular demand is here and so easy to use! Non- flavor ingredients: water, high-fructose corn syrup, modified food starch, xanthan gum, citric acid, sodium benzoate. Lemon Natural Flavoring has the aroma of fresh picked lemons and it is perfect to use when baking lemon squares or when marinating chicken overnight! Delicious when used in meat, fish and vegetable dishes. Just 1/3 teaspoon flavors 1 pound of pastries, dessert fillings or frostings. Lemon Natural Flavorings has an authentic flavor for sure! Made with natural flavors. Non-flavor ingredients include alcohol (55.5%), propylene glycol. 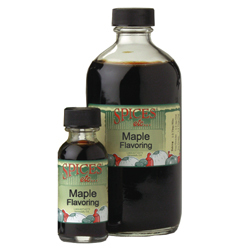 Maple Natural Flavoring is a great flavoring for ice cream and frosting. Not just for baking, Maple Flavoring can be added to sweet potato casserole or baked beans for a sweet hint of maple flavor! Try mixing a little of this flavoring in muffin or pancake batter to make you mornings taste even better! Made with natural flavors. Non-flavor ingredients include water, propylene glycol, sugar, alcohol (13.1%), caramel color, sodium benzoate. Orange Flavoring is a unique flavoring that has the aroma of a fresh squeezed Oranges! Whether you are using it to highlight your sweet rolls or to add to cookies, be sure to try a few drops of Orange Flavoring in your next batch of chocolate frosting. Orange Natural Flavoring is easy to use and perfect to add muffins and even to make homemade ice cream. Non-flavor ingredients are water, propylene glycol, corn starch, xanthan gum. Peppermint Natural Flavoring is a wonderful baking ingredient and is the perfect compliment to all things chocolate! Peppermint Flavoring is great to use in holiday baking or to add to that holiday martini for a little kick. Peppermint Flavoring is good in frostings, ice cream, and cold drinks any time of the year! Made with natural flavors. Non-flavor ingredients include alcohol (90.2%). Raspberry Flavoring is a concentrated flavoring that is wonderful when used in chocolate icings or cakes. Raspberry Natural Flavoring can also be used in desserts sauces, salad dressings or making a fresh smoothie in your kitchen. For a delicious treat, add a few drops to pudding or whipped cream for a subtle hint of sweet on your desserts and tongue. Made with natural flavors. Non flavor ingredients include water, alcohol (14.8%), citric acid, sodium citrate. Rum Natural Flavoring is a rich and full flavoring that is wonderful when added to frostings, truffles or puddings. It is also perfect when making Rum Raisin bread for a stronger taste of rum. You can also substitute rum flavoring for sherry flavoring in some recipes, if needed. 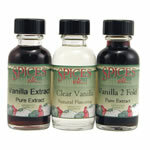 Rum Flavoring is truly an essential ingredient when baking almost anything in the kitchen. Made with natural ingredients. Non-flavor ingredients include propylene glycol, alcohol (50%), water. Strawberry Flavoring is perfect to use in almost any baking recipes calling for a berry flavor. It will make your strawberry pie recipe even better and can be added to daiquiris or ice cream for a real Strawberry treat! Strawberry Flavoring is nice to have around to boost winter strawberries that lack flavor. Made with natural flavor. Non-flavor ingredients include water, sugar, alcohol (14.8%), citric acide. Toffee Natural Flavoring can be used when making homemade fudge or chocolate or added when making muffins or chocolate chip cookies. 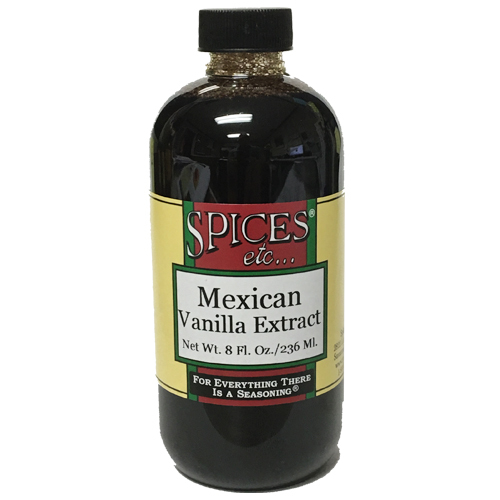 We added toffee because we had so many requests and this is a great baking flavor and it is a great flavoring to add to ice cream or cheese cake! Made with natural ingredients. Non flavor ingredients include water, sugar, propylene glycol, salt.